Ask a PR professional to explain what he or she does for a living and you’re likely to get some very different responses. The reason is that PR professionals wear so many different hats that on any given day, they could be involved in very different activities. This recent article from PR Daily explains four new roles for PR Pros: Blogger Relations, SEO, Crisis Mgmt and Metrics. It also implies some interesting changes about where the perceived value of PR professionals exists. What do you think is the biggest value of having a PR professional on your staff? It is important to have a PR professional on stuff because they tell a story of a company’s brand. They help a company grow, they guide and manage customer’s perceptions and the message they receive about the company. PR professionals help out with marketing by helping customer’s understand advertising the right way through articles, press releases, events, etc. It is important to have a PR on stuff because they are the voice of the brand in all the advertisements a company does. I like how you said PR professionals “tell a story of a company’s brand.” Well said. I would also add that they are kind of like relationship counselors, making sure the couple (company + publics) stay in love. They monitor and guide these unions, to help the bonds of connection grow strong. Love the way you said that as well – making sure the couple stays in love. I’m surprised when people do not really know about public relations because this is such a necessary element for companies to incorporate into its business model. I think it is so important! I agree with Jayson here, PR professionals are “telling a story of a company’s brand”. It is all about how you choose to tell the story to your publics. 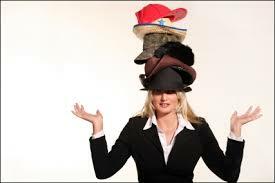 I think that PR professionals do indeed wear many different hats a day. I think the most important role of a PR professional is to understand both parties needs, having multiple perspectives. In order to understand the public’s needs they have to seek to understand. Once PR professionals are able to understand their publics’ and what they value–they are able to bond the connection between the person/company and their publics. Thus, in my opinion, PR’s most important role is telling the RIGHT story. Maintaining these connections is something that is just as important as mentioning the brands story and I feel it is important to bring that into the picture as well. I agree with Irina, that PR’s are a big part of helping the company grow, as well as guide and manage the company. In the article, from PR daily, it states that a lot of people refer to PR as a “spin”, PR is not a spin, its to guide the company to informing its customers/consumers in a potential crisis. PR’s important because they are what set the face of the company, like Irina stated, it helps customers understand the company as a whole, and in crisis situations, resolve the issue at hand. I think a good PR person and effective PR plan can bring the company success and profit to the next level, and also created great relationship with the troditional media and digital media. The new technology makes information travels so much faster than before, which can be serve both positively and negatively, therefore, PR staff need to spend more time to track feedback from their customers and news of their company. There is so much we have to manage both at work and at home. Sometimes it is difficult to find time to write and communicate through all the social media channels. After spending a large majority of your time on the computer dealing with in house requests, it is difficult to create a thoughtful piece for social media. Having a person that specifically deals with organizing and managing social media and other PR functions is excellent. They are able to compose a thought out piece of work because they have the appropriate time to do so. I’d love to hire a PR person so I could spend more time outdoors and away from the computer. I can see how the PR professional can easily run into a creativity “wall” when they have so many requests of them to come up with original and effective ideas. I can only imagine that in a world where every business is spending billions on advertising and PR while churning out original ideas every day, it puts a lot of pressure on the PR spokesman to outperform their competition. PR Professionals have a heavy load on their shoulders. It couldn’t have been said any better “The reason is that PR professionals wear so many different hats that on any given day, they could be involved in very different activities.” PR professionals are responsible for writing press releases, developing media contacts, maintaining positive client relationships, planning appearances and events and much much more. They are the spokesperson between the company and various groups. Reading the article really portrayed PR professionals in a different light. The world is changing right before our eyes. As digital media becomes more dominant I think that the roles of PR professionals will change even more and become more important. PR professionals will have more responsibilities and will have a greater value for companies in the future. Therefore, I agree with Ira and Renee as well! PR must independent, credible, and objective. In my opinion, I think that having a PR professional on stuff the biggest value is that can help company bring more successful and more profits. In addition, PR need to persuade the audiences such as through telling a story to easier closer relationship between company and customers. It’s an important that PR have a “touchpoint” between firms and consumers even PR may have some potential crisis to fix. In my opinion, PR professionals play a significant role in helping companies develop effective communications plans and deal with a variety of crises. The PR professionals usually have more professional skills to respond the public, and can strengthen community relations, increase an organization’s effectiveness. Therefore, it is critical and necessary to have a PR professional on staff in order to better manage companies. In addition, generally speaking, most large companies retain PR professionals, either internally or externally, to assist them in their communications efforts. Certainly, no matter a large or small firm, having a PR professional is a benefit to have an objective, credible, and independent point of view in working towards the group’s communications objectives and other goals. PR professionals are always looking for new ways to deliver appropriate messages to their clients. This may include public speaking and or communication plans. Often, public relations professionals will spend most of the day working with the media. PR professionals make phone calls, issue news releases, and plan story angles and events. It is essential to have PR professional within an organization. They are familiar with how to respond to the public, they know what the public needs in order to be satisfied and or happy. PR professionals are also used to create the communication’s of a company. The organization will always have goals to reach, therefor a communication plan is essential to all businesses as well as is obtaining a PR professional. It seems almost all large organizations either have a public relations department or outsource their public relations to other companies because PR professionals can help the organization maintaining its image via communicating its message to customers, investors and the general public in an efficient and effective way. I think this is the biggest value of having a PR professional on your staff. Like what I learned from class, PR professionals are promoter. They are not promoting a specific product, but the entire company. With their effort, the public build positive perception toward the company and then increase its sales and goodwill. The access to the Internet add more complexity to organization’s customer relationship management. In this case, PR professionals maximize positive use of social media such as blog, Facebook, Youtube and Twitter to monitor public opinion on organization which give the company a sense of emerging trends or problems. PR professionals are one of the most overlooked business professionals if you ask me. This PR class has taught me a lot about everything that PR people are involved in no matter what organization or industry you look at. I am lucky to be part of a company currently that strongly emphasizes the PR aspect of their business and it has really cemented for me just how crucial it is for organizations to have a strong public relations presence. On a turn of a dime, a PR professional could be dealing with a production crisis, or financial instability, or negative press all at one time. Being verse and the ability to differentiate topics and explain all in a truthfull and planned response is key. It is because the role of the PR professional varies so much on a day to day basis that I became interested in its pursuit to begin with. PR professionals absolutely wear many different hats, but this is also what keeps life and work life interesting. How many people go to a job every day in which they know almost exactly what they will be doing every hour on the hour by routine? For me, there’s nothing satisfying about this, which is why the PR profession is so attractive. For people who thrive in chaos, who love new challenges, or who at least like to juggle, and do so very well, this field has a lot to offer. I am also inspired by how many unique skill sets the role calls on. This isn’t an industry you’ll ever be done learning in. The Internet continues growing and new tools and ways for connecting and networking with others outside of your agency or firm are added to all the time. PR people are the most interesting to talk to because they see all sides of things and from many different perspectives. They are creative by nature, outgoing by demand, and personable by way of life. Effectively, this makes them the more interesting of types to sit in a room with. Their diversity in abilities is something that stands out anywhere, and I think the people who take on this role tend to be successful in many areas of life because life requires just as many hats if not more so, to take it on in full force. The role attracts a certain type of person by design, and those who don’t fit are quick to be recognized. I think thier most of value is skill for risk management. when crisis occur How company deal with it without PR person? the crisis always have possibility to hurt company’s brand and image so then Professional is needed. they can deal with the problem by many ways so they have many different hats for variety situation and crisis. PR will help company in crisis. I think that the biggest value of having a PR person is having a relationship with the public from someone that knows what they are doing. Having a staff member that creates intentional and consistent communication with the public is vital. They can handle negative situations and also create positive buzz. I believe that is true of many different departments in business to have to wear many different hats not necessarily just PR. It is very beneficial to have professional dip their toes in many different aspects of the company. They will have an understanding of different aspects of the business and be able to work together with other and understand what they are talking about. I honestly didn’t realize how important PR people are to any kind of business entity. They really do do a lot for companies especially with the advancement of technology. A business’ image and product value are becoming more and more on the line with so much public exposure through social media and news channels. Without a person that fully understands the market and publics relationships, a business will truly struggle because the product development and overall quality depends on that merge. Although there are many different aspects involved in a PR professionals job, I think the most important would be brand image/crisis management. Influencing public opinion is a large part of the job, and should be the main concern of PR. I never knew that metrics were an aspect of the job. I also wonder why the article states that PR professionals do not think of themselves as creative? It seems to me that with all the writing, ideas, and problem solving, PR is a sort of art form. As the definition of PR responsibility says, I think the most value able thing to have a PR professional is to keep a good relationship with the public. Without appropriate communication of a company with the public, the public does not understand what the company really want them to know. Like the article argues, the technology is changing the way we communicate with other people, so the traditional communication way that many companies have taken is not longer as useful as the new communication way such as social media and blogs. This is the reason why PR professionals need to different hats to keep the good relationship with the public. They will have more tasks in the future as technology evolves more and more. I feel that the biggest value of having a Public Relations professional on your staff is the fact that PR firms generate earned media coverage for their clients full-time, which means they have cultivated relationships with media contacts for years, and that they stay in regular and constant contact with the media. This increases the chance for media placement in higher-profile places than you alone are capable of.